Staying warm during the Winter months can be a problem, especially if you plan to enjoy some snowy Winter fun. Building snowmen, having snowball fights, and going sledding (all things that I plan on doing) can get quite cold. Even on days when you aren't planning to be out and about in the snow for long periods of time, the temperature can get quite cold. 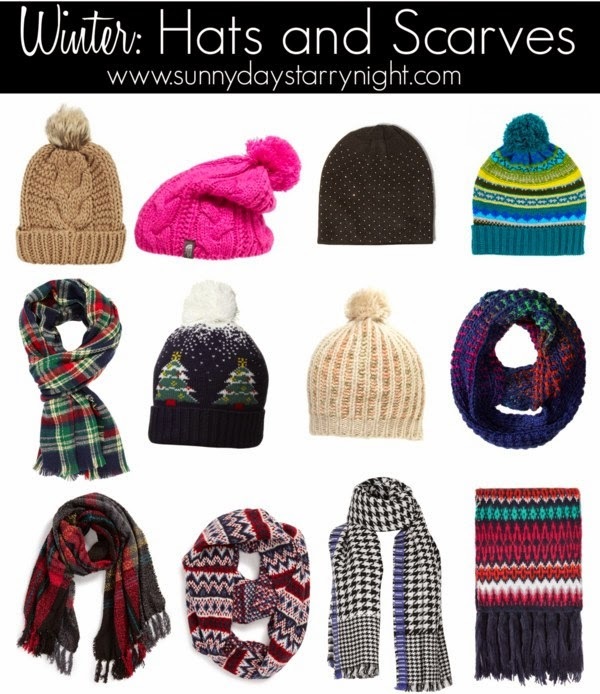 So every girls needs a few winter hats and scarves in a drawer. While Tracy and I were in NYC, I picked up a new hat and a new pair of gloves for myself at C Wonder. They have adorable foxes on them and the hat has a pom pom! I also have a few solids at my disposal. Here in south Italy it never snows but the cold is coming, wonderful hat and scarves selection! I want a plaid scarf but have such a hard time committing!!! It is so warm here in SoCal but I better get one for that cold snap day!!!! Love these! love the outfit in the photo. exactly as christina says above - there's only a small window where i can get away with wearing scarves. I need to get some new scarves. The ones you picked are so cute!